Optical sensors that measure the reflectance from the corn canopy and then attempt to use that information to manage the crop have been available for more than a decade now. GreenSeeker (TM Trimble) is one of the better known sensors. GreenSeeker sensors measure the amount of reflectance of near-infrared light relative to the amount of reflectance of red light from plant and soil surfaces, and convey this through a value known as the Normalized Difference Vegetation Index (NDVI). As the amount of photosynthesis increases a greater proportion of red light is absorbed by plants, resulting in less being available for reflection. The GreenSeeker conveys an increase in photosynthesis through an increase in NDVI, which is proportional to the total amount of photosynthesis occurring within a GreenSeeker sensor’s line of sight. The main ambition behind GreenSeeker use is to improve nitrogen rate management. There is still significant interest in the country side on how to investigate and deploy optical sensors. Here are few ideas to consider. The best fields for any variable rate technologies are fields with a high degree of variability where an avera ge rate of product (seed, fertilizer etc.) across the entire field may result in significant portions of the field receiving rates that are much higher or much lower than optimum. Variability in soil texture, drainage, organic matter and topography may result in variability in nitrogen availability (supply, loss) and crop yield potential which may result in variability is spatial nitrogen requirements. 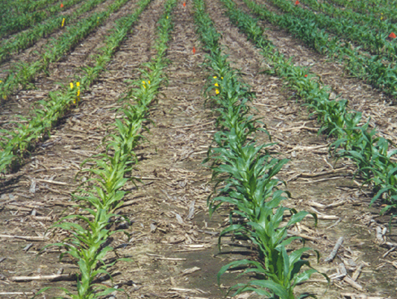 Nitrogen in starter fertilizer delays symptoms of nitrogen deficiency, supporting higher levels of chlorophyll and higher levels photosynthesis during early growth stages (Figure 1). This may reduce the potential of GreenSeeker to recognize nitrogen deficiency at side-dressing time, and may underestimate nitrogen requirements of plots. 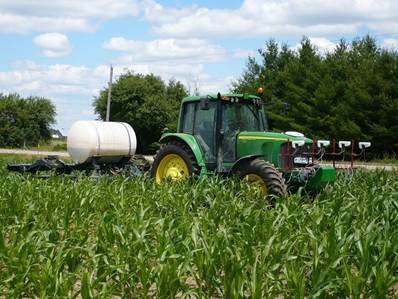 However, some nitrogen is required to carry the corn crop from planting until sidedress application. As a general rule trying to keep the starter N less than 15 lbs per acre may give you a better chance of detecting differences at normal sidedress time (30 cm high corn) than a higher starter or pre-plant N rate would. Figure 1. Nitrogen applications at planting will influence NDVI measurements and should be consistent across the field with the exception of the N Rich strip where N should be non-limiting. Due to variability in conditions across environments and time (soil type, hybrid etc. ), raw NDVI readings are not well correlated to nitrogen requirements. To overcome this, readings are made relative to at least one nitrogen-rich strip within each field where nitrogen is not a yield limiting factor. We suggest that these N rich strips should receive a minimum of 175 lbs N/acre early in the season on top of what was applied as starter. Readings from the field are adjusted relative to these strips; regions where NDVI values are equal to or higher than the N-rich strip would not be expected to receive any benefit from additional nitrogen, while regions that are lower than the N-rich strip are likely deficient and may respond more to additional nitrogen. Research with GreenSeeker in nitrogen rate studies in Ontario has demonstrated that it is easier to detect differences in NDVI between nitrogen rate treatments as time progresses during the growing season. While delaying readings may improve detection of nitrogen deficient areas of the field, the bulk of side dressing equipment in Ontario requires application to occur when corn is less than knee-high. To facilitate the use of GreenSeeker as a variable rate nitrogen tool, nitrogen rates should be limited to the amount required to carry plants to the sensing stage (i.e. 10-15 lbs N/ac for traditional V6 sidedressing), and should be completed as late as reasonably possible for side-dressing. High clearance application equipment is probably more suited to sensor technology where N can be applied later in the season (i.e. waist high corn and beyond). In these situations additional N at planting may be required (20 -50 lbs N/acre) to carry the plant into these later growth stages for sidedressing with high clearance equipment. The GreenSeeker sensor emits light of specific wavelengths onto the crop canopy for use in any lighting conditions, and measures reflected light for developing NDVI readings. Multiple sensors are typically mounted to a boom to be clear of obstructions within 12” of the sensor lenses, and for corn are positioned directly over the rows (Figure 2). Performance is maintained as long as sensors operate within 28” to 48” of the top of the crop canopy. Microprocessors in the sensors calculate NDVI values which are sent to a PDA mounted in the cab where data and GPS location are logged. Software in the PDA process NDVI values through an algorithm which forwards a rate to the applicator rate controller to adjust the amount of nitrogen being applied. The GreenSeeker algorithm is the formula responsible for converting an NDVI reading from a field to a nitrogen recommendation. While specific algorithms differ in their response to field conditions and NDVI values based on calibrations to the local regions, the basic premise of most corn algorithms is the same, as demonstrated in Figure 3. NDVI values which are very low relative to the N-rich strip (less chlorophyll, less plant biomass) are limited to a minimum amount of nitrogen which may be set by the applicator (1). Yield potential is expected to be low in these areas and factors other than nitrogen may be limiting, thus little yield response to nitrogen is expected. As NDVI values increase, nitrogen recommendations increase (2). Yield potential is expected to increase relative to plants in the very low NDVI range (1). Low NDVI readings relative to the N-Rich strip suggest nitrogen may be limiting, and thus a response to nitrogen may be expected. Yield response to nitrogen is expected to increase with NDVI up until a maximum (3). Beyond the maximum point, nitrogen recommendations decrease with increasing NDVI, as NDVI values are approaching the N-rich strip where nitrogen is not a yield limiting factor (4). When NDVI is equal to or higher than the N-rich strip, nitrogen recommendations are equal to the minimum rate, as no yield response to additional nitrogen is expected. A number of algorithms for various crops and regions are available. A number have been calibrated for corn in regions such as Minnesota, Missouri, Ohio and Virginia. Currently, no algorithm has been calibrated for Ontario conditions. Custom algorithms can be developed where a user can manually enter application rates for given NDVI readings ranging from 0 to 0.99. Our approach in OMAFRA lead nitrogen rate research is to deploy an algorithm that essentially calculates an average field rate based on the N Calculator (www.gocorn.net) and matches that rate with an average NDVI reading from the field. Then we let the GreenSeeker apply more or less N across the field based on NDVI readings and the relationship illustrated in Figure 3. The Ontario Corn Nitrogen Calculator (N Calculator) is one method of developing a field average nitrogen recommendation. The sidedress nitrogen requirements of a hypothetical corn field are estimated using the characteristics outlined in Table 1 below. Based on the characteristics of this field, sidedress nitrogen recommendation would be 110 lb-N/ac. On-farm trials can be conducted to assist in determining if GreenSeeker variable rate nitrogen technology can improve economic returns relative to field-average nitrogen recommendations on your farm. First, an N-rich strip supplying nitrogen at a non-limiting rate at planting time would be required to conduct the GreenSeeker treatments. To investigate yield response to the variable rate component of GreenSeeker, a GreenSeeker variable rate nitrogen treatment would be compared to a fixed-rate treatment applying the average application rate of the variable rate treatment. To investigate yield response to the rate selection component of this technology, the average fixed rate GreenSeeker treatment would be compared to the actual N response of the field as determined by the yield response across the fixed low N rate (1/3 of N calculator rate), fixed N calculator rate, and fixed high N rate (N calculator rate plus additional 1/3). Treatments are summarized in Figure 4. These treatments could be laid out and applied near planting time (N-rich strip) and side-dress time (remaining nitrogen treatments) within an existing corn field. 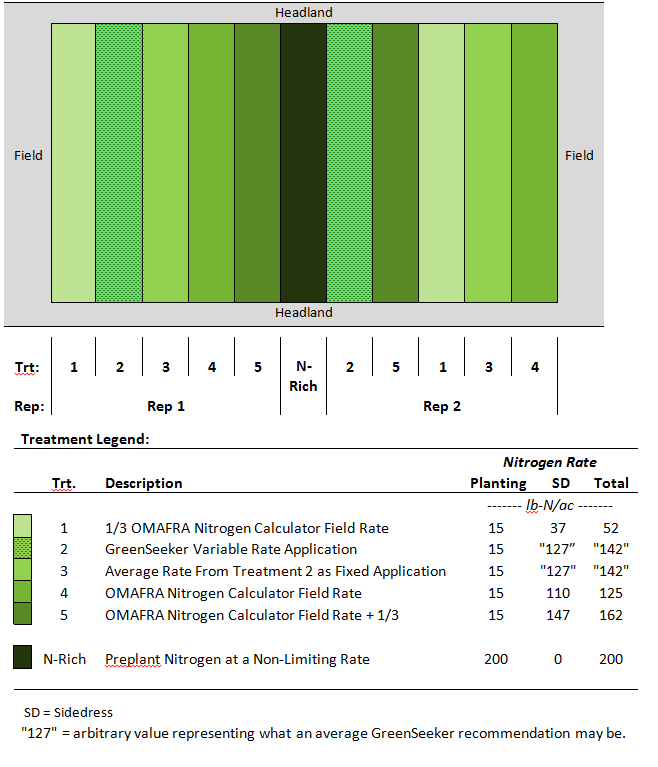 An example of a plot-plan is outlined in Figure 4 where nitrogen treatments are randomized across two reps with a single N-rich strip in between. Figure 4. Two rep plot plan and treatment legend for comparing GreenSeeker variable rate nitrogen relative to existing corn calculator recommendations within an existing corn field. There are two possibilities that exist for how the GreenSeeker might improve your N management in corn. The first one is that it might be able to predict what the correct average rate for your fields are based on relative NDVI scores. That is, can it do better than the N Calculator in getting the average right rate for your field if you feed it NDVI scores from the N rich strip and the unfertilized zones in the field? If this is the key question then yield results from the whole field length strip (i.e. weigh wagon measurements) will do the job. The second aspect of the how the GreenSeeker might help is to not necessarily change the average rate across the field but to move N from where it is needed less to areas where it is needed more. Thus improving yield per unit of N applied. In this case you must then have more than whole strip data; you must have site specific GPS referenced data for both NDVI and yield all the way down the strip. This will enable you to cut up the strip and decide in a certain area whether the GreenSeeker algorithm was making the right decision or not. For example, if you go through a part in the field where response to N is low and yields are quite similar between the high N fixed rates and the low N fixed rates then the GreenSeeker should be automatically pulling the N rate down at those locations. Only with thorough site specific analysis of the strips can you determine where the GreenSeeker is making profit improving decisions.